I bought a vynal copy at a garage sale. Case is bad shape but autographed by "N.W.A.'. I'll email a copy of a photo.. Vynal good a not perfect but o.k. I'm one of the seemingly few that discovered NWA with their 1987 debut "album", as opposed to the Ruthless driven NWA/Eazy-E Explosion of 1988/1989 (and the Ruthless repackaging of their debut album later). I use the term album loosly as Macola was notorious for packaging random 12"s of theirs into compilations, but not making it clear they were comps. I suspect this was always the case with their debut album. Prior to the NWA & The Posse album, Macola had a comp entitled "The Posse", but it was EARLY Macola 12"s by Digital Underground, DJ Battlecat, 2 Live Crew, Ice T, etc. 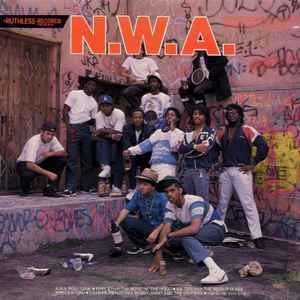 NWA's debut album comes off the same way, as it compiles Fila Fresh Crew, Arabian Prince, Eazy E solo, and NWA. Granted, most of those acts were produced by Dr. Dre, creating a common thread (unusual for Macola at that time), it still was another Macola compilation. I figured the only way to understand NWA's history and evolution was to track down the 12"s individually (including Ice Cube's solo 12" that didn't make the cut of the 1987 comp/album). This is possibly the most essential release of their entire catalog to understand their evolution. When I was still just a wee lad, N.W.A. 's 'Straight Outta Compton' tape got some pretty heavy rotation in my boombox. I recently picked up this 12", and it's really interesting to see the direction in which N.W.A. could have gone (but didn't). The songs '8-Ball' and 'Dope Man' are both great--but they're definitely done in the style that people tend to think of when they think of late '80s-era West Coast gangsta rap. The first cut on the A side, however, is completely different. 'Panic Zone' is one of the best electro hip-hop jams you'll ever hear. Dr. Dre was fresh from his work with the World Class Wreckin' Cru, with whom he had produced some classic West Coast electro-funk jams that were 180 degrees removed from the gangsta rap for which he would become known. 'Panic Zone' also heavily featured the work of The Arabian Prince (a.k.a. Professor X, a.k.a Mik Lezan), whose style clearly didn't fit in with the direction in which N.W.A wanted to go, evinced by Ice Cube and Eazy E (whose presences are felt much more strongly on 'Dope Man' and '8-Ball'). The Arabian Prince didn't work with N.W.A. for very long, and it's easy to see why. 'Panic Zone' is amazing, hard-hitting electro-funk, but it just didn't fit with the direction West Coast rap was heading for in the late '80s. However, if you're even a casual fan of '80s electro-funk, you owe it to yourself to find a copy of this record.